This article by Dr Paul Butler of the School of Ocean Sciences originally appeared on The Conversation. Read the original article. For the local Pangnirtung Inuit, the Greenland shark is an animal that does not die easily. "Dad used to say to me that sharks’ flesh has a hard time dying. The shark can be rotten, even sticky rotten, and when you touch the skin or the meat it still moves. You know, it is still alive but it is rotten." 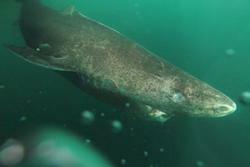 Greenland shark. : Image courtesy Julius NielsenThis might sound rather gruesome, but it turns out that this reputation has an element of truth to it. With an estimated lifespan of 400 years, the Greenland shark has just been reported to be the longest-lived vertebrate on the planet. This is only the latest of a series of recent findings that push the boundaries of animal longevity, and it raises the perennial question of what factors enable some animals to achieve what we might call extreme longevity – lifespans that can be measured in centuries. The key to becoming a long-lived species is for individuals to regularly die of old age (and not from disease or being eaten) in the first place. Experiencing age-related degeneration allows a species to evolve resistance to it. So an effective defence mechanism against predators, such as a thick external shell, must be in place first. Once this “safe space” has been achieved, living longer becomes a way to produce more offspring in the most efficient way, especially when the food supply is intermittent. Here are five of the longest-living animals ever recorded. As well as being a top predator itself, the Greenland shark has developed a defence against predators in the form of highly poisonous flesh. Not being hunted in its early years allows the shark to pursue a more relaxed reproductive strategy. Females don’t reach reproductive maturity until an estimated age of 150 years. At the high latitudes where the shark lives, the limited amount of light during the winter means fewer plants and algae for other creatures to feed on, which can affect the amount of nutrients right up the food chain. So the ability to withstand the poor years and reproduce during the good years is key to the shark's’ survival, and a long lifetime is a great way to maximise the number of good years. The clam species Arctica islandica holds the record for the longest-lived animal known to science.The clam species Arctica islandica holds the record for the longest-lived animal known to science. We can measure its exact age by counting the annual bands in its shell, and this is how we identified a specimen (now popularly known as “Ming”) collected from Iceland that had lived for 507 years. 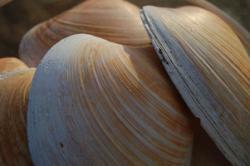 In common with many species of mollusc, A. islandica grows more slowly and lives longer with increasing latitude. North of Iceland, they regularly live more than 300 years, while further south in European and North American waters (where nutrients are less limited) their age limit is about 250 years. As with the Greenland shark, this is a useful reproductive strategy in nutrient-poor waters when there is no threat from predators. A bowhead whale collected during a whaling expedition off Alaska in 2007 was found to have the head of a late 19th-century harpoon embedded in its neck blubber. Its age was estimated by radiocarbon dating to be 211 years, making this the longest-lived mammal so far identified. Unlike other whales, the bowhead lives entirely in cold Arctic and subarctic waters. Once again, this suggests a strategy that uses longevity to compensate for low nutrients in the winter. Analysis of bowhead whale DNA suggests that the lack of natural predators has enabled the whale to evolve natural mechanisms to resist age-related decline. For example, cancer, while occasionally present, is extremely rare. The only terrestrial animal known to live beyond 200 years, the giant tortoise, is now confined to a few islands in the Indian and Pacific Oceans. An individual Aldabra giant tortoise died in a Kolkata zoo in 2006 at an estimated age of 255 years. The oldest giant tortoise living now, a Seychelles tortoise called Jonathan is reportedly 184 years old. The giant tortoise employs a “belt and braces” approach to predators, and maintains its thick shell even while living on isolated predator-free islands. Without the fear of predators, the animal can –- like the Greenland shark and A. islandica – slow its metabolic activity right down, helping it to survive periods of drought when food supply is limited. Jeanne Calment, who died in 1997 at the age of 122, was the oldest person (and probably the oldest land mammal) ever to have lived whose age has been precisely verified. In fact, Homo sapiens is the only terrestrial mammal known to live for more than 100 years, and it is an interesting question whether this was the case even before the advent of organised agriculture. One indicator of longevity in mammals seems to be brain size. This reflects an increased ability to adapt to a changing environment and, of course, is also an effective defence against predators. It seems that even early humans, if they could survive childhood, commonly lived to 70 or 80 years, significantly longer than the other great apes. The frequency with which modern humans live beyond 100 years may also be related to modern medical practice, or may simply reflect the sheer number of humans.